1. I LOVE kitchen gadgets. 2. But I don’t know what to cook in a slow cooker. 3. Well, I can learn. In the end, Points 1 and 3 won out, especially after I saw my friend Cathy’s recipe for Chile Verde. I followed her recipe to the word except for some toppings at the end and some creative ingredient substitution. Note: Ok, so my aforementioned “creative ingredient submission” is code for “I don’t cook enough to know my way around the supermarket.” I had NO idea what a 28oz can of green chili was – there weren’t 28oz cans of anything in that general canned section except for peaches and pumpkin pie mix (and I was pretty sure that wasn’t right). I ended up getting five 5-oz cans of whole green chilis and throwing in an extra jalapeno to make up for the difference. Some supremely vague (on my part) texts to Cathy afterward failed to determine if I indeed purchased the right ingredient. It’s all good though, right? They’re all verde, at least. 2. Combine the cumin, oregano and salt and set aside. 3. 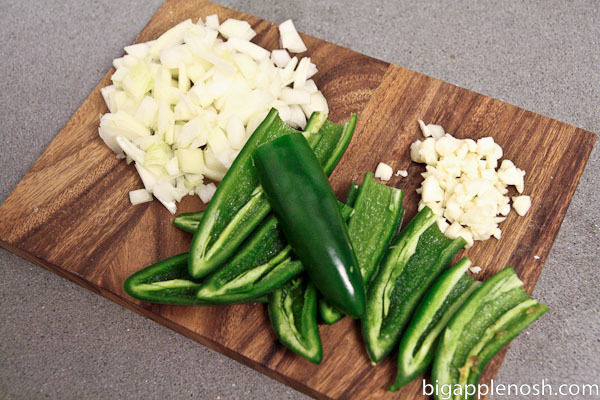 Blend the salsa verde with the jalapenos. I used a hand blender because the regular blender is on a high shelf and well…there you go. 4. 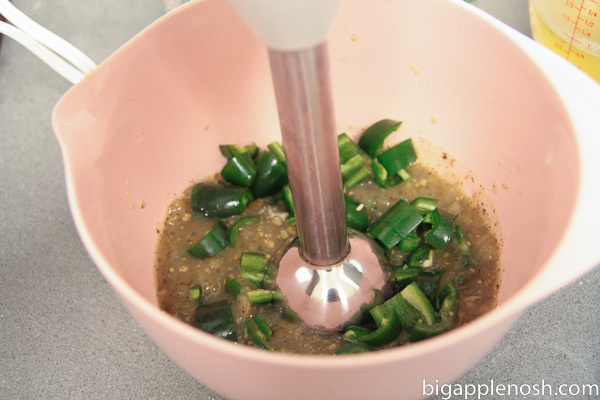 Then, blend 1/3 of the green chilis and cube the rest. Ok I hope these were the green chilis I were supposed to get! 5. Cube the pork, add a little olive oil to a large pan and and grey it over medium-high heat (don’t brown it, just quickly sear the outsides so that it seals in the juices in the slow cooker). 6. Transfer the greyed pork to the slow cooker and turn the heat down to medium. 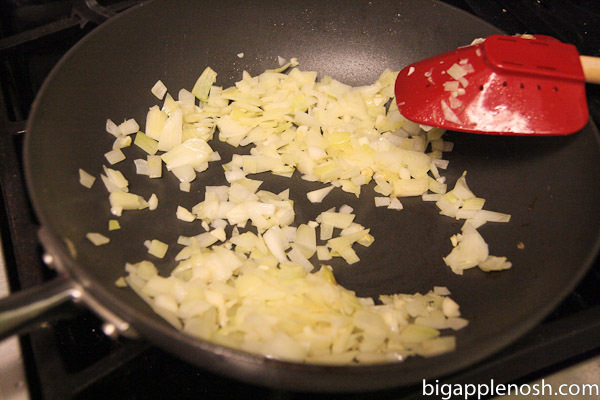 Add a shake of olive oil, then onions and the garlic and soften it a little while scraping up all the pork bits and juice that have stuck in the pan. 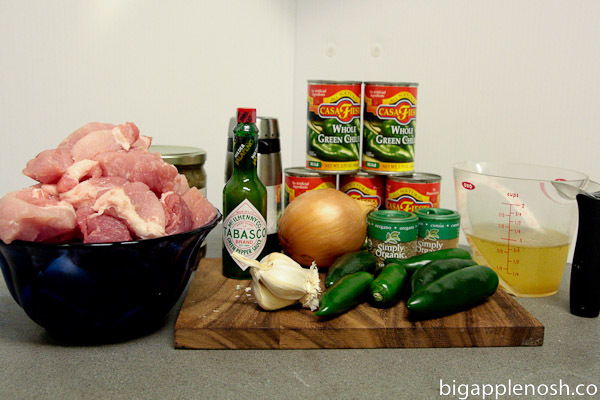 Cook for 3 minutes, stirring constantly and add it to the pork in the slow cooker. 7. 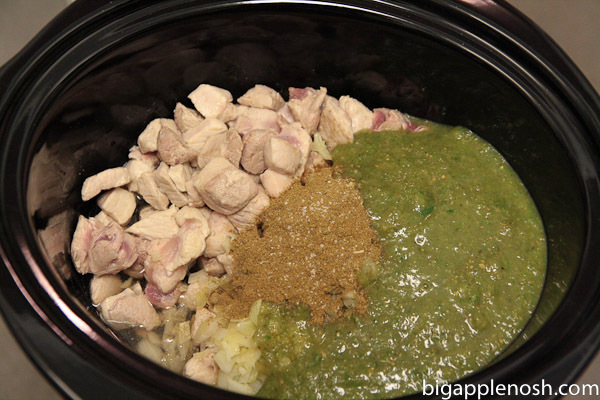 Add the blended ingredients, 1/4 can of chicken broth and HALF of the cumin mixture to the slow cooker and stir. Set it on low for 8 hours. This is where I stopped, put the shindig in the fridge overnight, and set it to slow cook before I left for work the next morning. 8. If you’re home, half way through the cooking process add the chopped green chiles and the remaining cumin mixture, as well as some green hot sauce (whatever you have… if you like it spicy). If you don’t work at home and are doing this on a weekday, just add this stuff as soon as you get home. If it’s looking too thick for you you can add some more chicken broth, but I like it thick so I usually stick to the 1/4 can. 9. Let it finish out cooking and then serve with tortillas. Inhale. Of course, a girl’s gotta have carbs, so I whipped up some honey cornbread to go with the whole shindig and topped the chile verde with some Fage 0% Greek Yogurt and shredded cheeeeese! YUM! This was SO yummy, and super filling as well. I would consider my first slow cooker experience a success! There was just something so nice about coming home after a day at work and having dinner all ready for you. Question – the prep actually took a while (partially due to my aforementioned slow chopping) – do most slow cooker recipes require this amount of prep? Anyone have a favorite slow cooker recipe? Taking suggestions! OMG this looks divine! I need to try this ASAP! Yum, looks spicy and delicious! Yum! bring on the spice! I can take it 🙂 Have a great weekend, sweetie! Yay! I'm glad it turned out! …the slow cooker recipes I cook usually take that long to prep, sadly. I try not to use TOO many canned ingredients which is why it always ends up that way (lots of chopping). 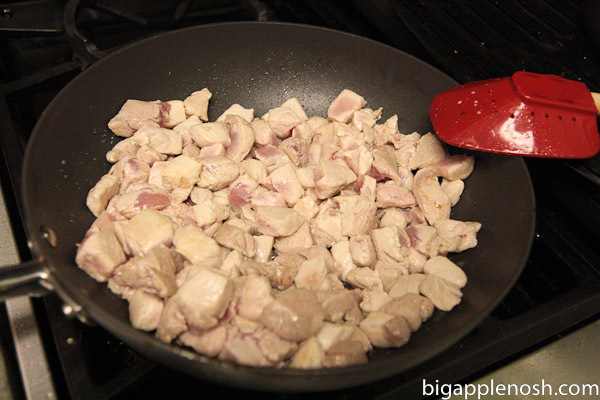 Many people like "salsa chicken" which is literally chicken covered with salsa…that's 1 minute prep for sure! I've never tried it but I always hear rave reviews. 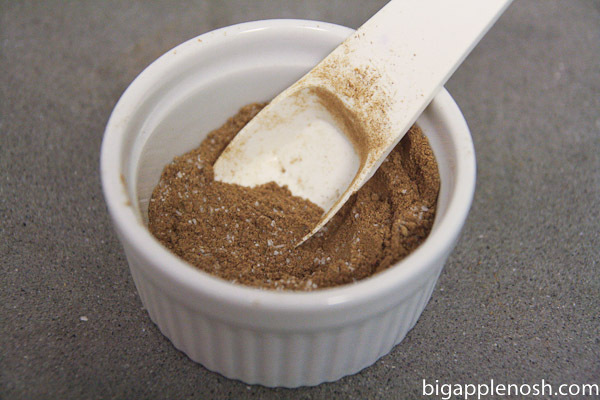 the spice blend gives it a very unusual (in a good way) taste! 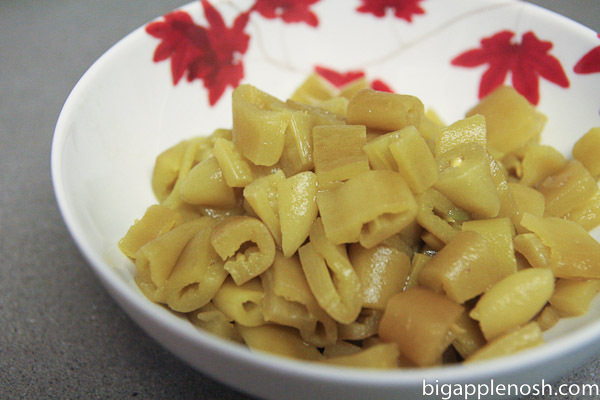 Congrats on your first slow cooker recipe! I love walking into the house at the end of the day to a house that smells like dinner! I LOVE my crockpot, but too despise the long prep time. 🙁 Can't wait to see what other recipes you have in store!! yum! I'm a big fan of the concept of a slow cooker and yet I still haven't used mine. I'm worried about using it when I'm gone because of the whole catching the house on fire thing, but maybe I need to chill out and just try it once. Slow cookers are awesome. and skip the slapchop, it doesn't work b/c the blade is not a blade but just a metal piece, and chunks get stuck in the corners. Most slow cooker recipes I find say you should brown your meat first, followed by a quick saute of the veggies. I usually skip right past this and just dump everything into the crock pot. I haven't found that the extra step of browning of the meat added anything. As long as the slow cooker has been on long enough to break down the meat, I'm happy. Plus, I'm just super lazy and hate washing extra dishes. Nice combination of ingredients; cumin, oregano and green chili. Love that! I love chile verde! Living so near Mexico we have a lot of delicious chile verde around. This looks really yummy, I love the crock pot idea! I'll have to give it a try this weekend. It was fabulous and simple. check it out if youd like. I love my slow cooker in principle but honestly rarely ever use it! 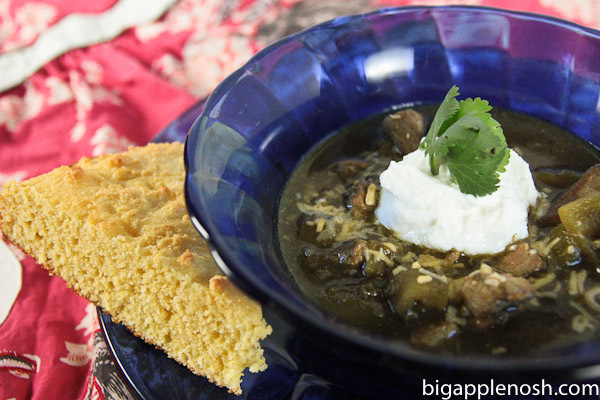 I definitely need to break it out and give this chile verde a go….looks delicious! This makes me want to get a slow cooker! another delicious dish! 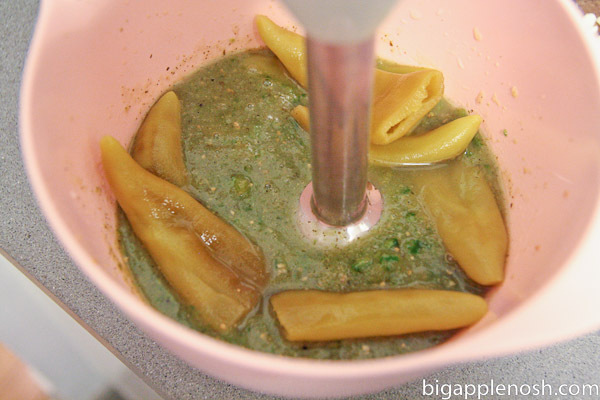 i love verde sauce and am telling hubs about this recipe.